A request to provide health insurance for three office staff members is also on the meeting warrant that will be considered Saturday. BENTON — Voters at Town Meeting on Saturday will consider appropriating $625,000 for the municipal budget, a figure that is about a 5 percent, or $30,000, increase from last year’s $593,000 total. 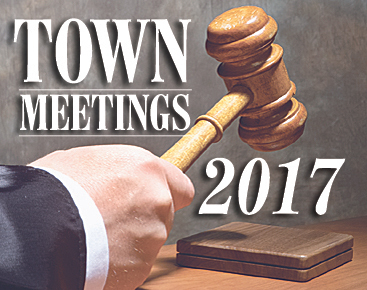 The meeting is scheduled for 10 a.m. at the Benton Grange Hall and is to be preceded by election of officers from 1 p.m. to 6 p.m. Friday at the Town Office. There are no contested races this year. Incumbent Selectwoman Melissa Patterson is running for re-election to a three-year term, as is Road Commissioner Leroy Littlefield, for a one-year term. No one is running for a seat on the School Administrative District 49 Board of Directors being vacated by Sarah Kate Flood-Gerow, who took the spot after the death last May of board member Harry Fitzpatrick, according to Town Clerk Susan Rodrigue. The 2016 town report is dedicated to Fitzpatrick, who was on the board 18 years and was the Benton Cemetery Committee chairman for 16 years. Rodrigue said voters may write in names for the open school board position on the ballot, and the person with the most votes will be elected to a three-year term. The school and county budgets are not included in the warrant. Included in the 92-article warrant is a request to join Maine Municipal Association’s Employees Health Trust in order to offer health insurance to three Town Office staff members for the first time. Rick Lawrence, the town’s tax collector and treasurer, said Thursday that other area towns, including Fairfield and Clinton, provide such insurance. “We shopped around and we talked to these towns and we talked to MMA,” he said. The town’s Budget Committee recommends voters approve the request, as well as a request to appropriate $75,057 to enroll the three employees in Maine Municipal Employees Health Trust. Another article asks voters whether to appropriate $11,000 from tax increment financing funds to have an engineering firm develop a conceptual design of a fish harvesting facility near the Benton Falls fish lift, in order to make harvesting of river herring easier and more effective. The Budget Committee recommends approval of the proposal. Lawrence, who also is the town’s alewife warden, said the fish population is healthy, but because of equipment breakdowns at the dam, including a turbine that broke Wednesday, fish harvesting is bringing in a lot less to the town than it should. The proposed increase in the budget this year is reflected in insurance and other items, including extra hours staff members have worked because their workload has increased; but the town has contained other costs, according to Lawrence. He used as an example an article that asks voters whether to back a Budget Committee recommendation of $55,000 for summer road maintenance and repair for the year. “We raised $55,000 last year but spent $30,000,” Lawrence said. Other items on the town warrant include a Budget Committee recommendation to take from excise tax and block grant receipts $128,000 for paving town roads; $180,000 for fire protection and rescue services, $100,000 for solid waste disposal, and $19,000 for law enforcement dispatch services provided by the state Department of Public Safety.